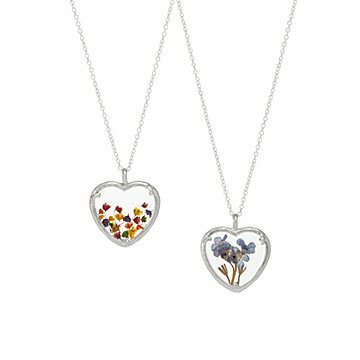 Catherine Weitzman's silver heart pendants contain dried flowers symbolizing love and lasting connection. Catherine Weitzman's handcrafted necklaces say "I love you" with more than their heart-shaped pendants. Each silver heart contains lovely little dried flowers, pressed between clear glass panes: Delicate baby's breath symbolizes everlasting love (making it a favorite in wedding bouquets), innocence, and purity. Forget me nots, as their name suggests, represent fond memories and lasting connections. Whether you're celebrating romance or letting someone close to your heart know how much you care, these meaningful pendants make thoughtful gifts for anniversaries, graduations, holidays, or even just because. Handmade in Hawaii. Pendant: .8" L x .9" W Chain: 20"
My daughter has worked with me in the publishing comapny I founded to publish my novels and photography and illustrated books we have done together. I bought this gift to commemorate the tenth anniversary of our publishing company.